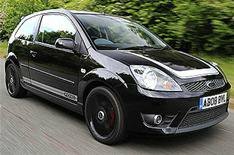 First drive: Ford Fiesta ST500 | What Car? You can tell when a car's about to go off sale, because the limited-edition versions come thick and fast. This ST500 is the latest run-out Fiesta. Based on the sporty range-topping ST, it gets black metallic paint, tasty 17-inch black alloys, and silver stripes on the outside, as well as carbonfibre-look trim and heated leather seats on the inside. This is a mean-looking little car. Sadly, it doesn't have the bite to match its bark. It's brisk rather than fast in a straight line, although top-notch handling makes it fast along a twisty road: it's a hoot to drive. Short gearing means that the engine is revving hard on the motorway, though, and there's plenty of road noise. This isn't a quiet car. Taller people may also wish that the driver's seat went lower. Considering its extra kit and rarity (just 500 will be made), the ST500 seems like good value next to the standard ST. However, 15,000 is a lot to pay for an ageing car and, with the new Fiesta going on sale in October, it'll lose value quicker than a sub-prime mortgage salesman.